We renovated an old traditional Japanese house which has been living for more than 100 years to make it Dot Hostel Nagano in 2016 April, so here you can feel like real traditional Japanese life with us. 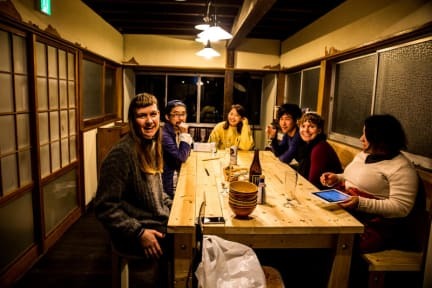 We are a small hostel and small team to make you comfortable and help you to make the most out of Nagano. The hostel is only 1 minutes from the Zenkoji Temple and 20 minutes from Nagano Station, enabling you to have easy access to all that the lovely city has to offer. Dot Hostel Nagano has 4 rooms: Mixed dormitory, Woman only dormitory, Single room and Tatami room. There are a big common living, where we can eat and drink as well as work with laptop by using free Wi-Fi. We serve free continental breakfast(toasts and jam) with free coffee and tea. We have a mini sake bar, serving local sake and craft beer with reasonable price. Our staffs are fluent in English and hence we can advise you where to go and what to do in Nagano in English. - You can leave your bags and luggage before check-in unless you inform the hostel beforehand. (1) The hostel is not suitable for children, especially in dormitory room. (2) The minimum age to stay at the hostel is 6 years old. 6. Reception Hours: from 08:00 to 11:00; from 16:00 to 22:00. (1) Please lower the voice after 22:00. (2) The lights are off at 23:00. 8. The shower room, bathroom and kitchen are shared with customers. - The kitchen is open from 16:00 to 22:00. 9. No smoking in the entire building. If you are going to Nagano, Dot Hostel Nagano is the right place to stay!! I enjoyed my stay there. The hostel is about 20-30min walking from Nagano central station and very close to the Zenko-ji Temple. The room was clean as well as the common areas in the hostel. The staff was super kind and absolutely helpful! I 100% recommend Dot Nagano Hostel.